Two months ago, an angelic deity (or a thirsty headline) prophesied that a new savior—a cheap, fun sedan that some might call the “Audi-Slayer”—would beam down from the Ford heavens, gracing us with tons of power and all-wheel drive. I just drove this chosen one, the 2017 Ford Fusion Sport, and it wasn’t the spiritual experience I expected. The Ford Fusion Sport is kind of a big deal. Every automotive outlet, including us, has been talking about how the Blue Oval’s new powerful Fusion could be a great all-wheel drive sports sedan that will compete with the Germans for far less money. And the specs totally suggest just that. The car makes 325 horsepower and a Holy Crap That Can’t Be Right? But It Is! 380 lb-ft of torque from a 2.7-liter EcoBoost twin-turbo V6 pulled from the F-150 and Edge Sport. All that power gets sent through a torque converter, then a bunch of gears, and then through a bunch of shafts, before ultimately arriving at all four wheels. Add to that Ford’s standard Continuously Controlled Damping system—which adjust damping rates based on driving conditions—and a sport mode that adjusts steering calibration, transmission shift schedule, throttle response and engine sound, and you’ve got a promising spec sheet begging to be compared with an Audi S4 or a BMW 340i. The truth is, the Fusion Sport really was never meant to compete with the likes of Audi and BMW; that wasn’t at all the point. The whole point, Ford told me at the press event, was to give mid-size sedan customers a bit more. That doesn’t mean transforming the Fusion into an Audi-slayer. It simply means offering a bit more power and re-tuned handling to satisfy customers who might have a family, but still like to do a bit of spirited driving now and again. 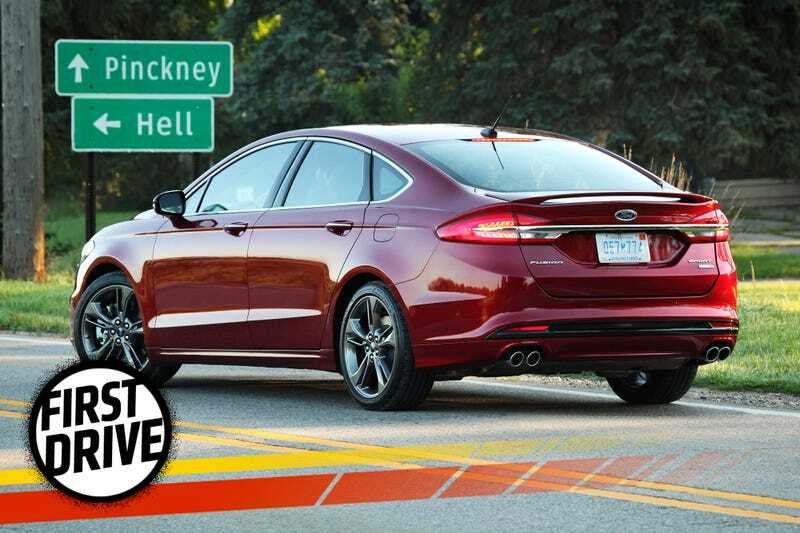 In other words: the Fusion Sport is a family sedan first and a driver’s car second. That fact quickly became apparent when I arrived at the media event, which wasn’t at a track, but rather at a fancy golf course near Hell, Michigan. While Ford definitely pointed out the powerful V6 and the Continuously Controlled Damping that can mitigate body roll in the turns, its emphasis seemed to be more on convenience-oriented aspects of the Fusion Sport. For example, the first thing I did when I got to the event was a demo on the Fusion Sport’s Continuously Controlled Damping system. Ford had lined up two competitors—a Toyota Camry XLE V6 and a Honda Accord EX-L V6—to show me how the Ford’s ride quality compared to that of the competition. The next thing we did was try out the Fusion Sport’s Enhanced Active Park Assist System, which basically involved me pressing a button to turn on the mode as I drove past a parking spot. The Fusion’s proximity sensors noticed the opening, and told me to shift into reverse and not touch anything except the brake as the car slowly backed into the space. It worked well. So here I was at a press drive for a hotly anticipated sports sedan, and we were doing little parking lot demos to showcase how the car drives over potholes and automatically pulls into parking spaces. We eventually did head out on a drive course through the twisty roads of Hell, Michigan, but only after being told we really ought to try out the Adaptive Cruise Control with Stop & Go. Not exactly the most thrilling stuff you can do on pavement. There’s nothing wrong with that, though. Perhaps it was our fault for looking at the Ford’s specs and automatically assuming it would be an enthusiast’s car. It’s not one. The acceleration itself was okay, but the six-speed automatic didn’t take my breath away with its ridiculously smooth, if a bit leisurely shifts. And the paddle shifters took my commands, contemplated telling me to go pound sand, and then begrudgingly moved the cogs in the gearbox. As for handling, the Fusion Sport seemed comfortable enough on the twisty roads through the woods of Hell, though I really couldn’t test its limits, as there were police cars chaperoning my every move. One pulled out from its hiding spot just as I drove by, scaring the living bejesus out of me. So I slowed down from then on. I did drive the Fusion back-to-back with the Honda Accord V6, and here’s the thing: the Honda just felt more like a driver’s car. With the transmission in sport and the gas pedal to the floor, the Honda’s 278 horsepower engine, unlike the Ford’s, sent a noise through the cabin that made me well aware that my foot was about to pierce through the floorboard. I just enjoyed driving the Honda more. The 450-pound disparity in curb weight—yes, the Fusion sport weighs a whopping 3,982 pounds—was obvious to me as I drove the two in around turns and zig-zagged through a big empty parking lot. That difference in weight, along with the Honda being front-wheel drive instead of all-wheel drive, also probably contributes to a 21/33/24 city/highway/combined fuel economy rating, compared to the Fusion Sport’s 17/26/20. So no, the Fusion Sport isn’t the prophet we car enthusiasts hoped for, despite the unique fascia, big 19-inch wheels, powerful V6 and adaptive damping. The sound, the transmission, and the heavy curb weight mean it’s really meant more for the mom or dad who wants to look back in their rearview mirror at their child in the back seat and say “Hold on, kids! We’re going to light speed!” and then gun the engine for a bit of weekend fun. But it’s still a lot of car for $34,350. Sure, from the outside, it’s basically an SE Luxury Fusion with a slightly tweaked front fascia, but it’s still a handsome car. And on the inside, sure it looks a bit dated, but the Fusion Sport’s suede and leather seats are very comfortable, the dial-shifter is easy to use, and controls are all very functional. It’s not an enthusiast’s car, but for someone looking for a quick-ish family sedan with all wheel-drive, the Fusion Sport is a solid option. Which Honda Accord Is The Best Of Them All?